The American Dream: the belief that anyone can come to America and, with hard work, achieve whatever they want, regardless of background; the ideal that anyone can climb to the top and reach happiness. Welcome to the beautiful Sinclair family. The Sinclairs are athletic, tall, and handsome. We are old-money Democrats. Our smiles are wide, our chins square, and our tennis serves aggressive. It doesn't matter if divorce shreds the muscles of our hearts so that they will hardly beat without a struggle. It doesn't matter if trust-fund money is running out; if credit card bills go unpaid on the kitchen counter. It doesn't matter if there's a cluster of pill bottles on the bedside table. It doesn't matter if one of us is desperately, desperately in love. We live, at least in the summertime, on a private island off the coast of Massachusetts. Perhaps that is all you need to know. Well. I am, without hyperbole, three years late to the We Were Liars party, but after around 736594 bloggers threw this book at my head and demanded I read it, I took their advice. I'm glad I did. We Were Liars is remarkable. Harris came into his money at twenty-one after Harvard and grew the fortune doing business I never bothered to understand. He inherited houses and land. He made intelligent decisions about the stock market. He married Tipper and kept her in the kitchen and the garden. He put her on display in pearls and on sailboats. She seemed to enjoy it. Granddad's only failure was that he never had a son, but no matter. The Sinclair daughters were sunburnt and blessed. Tall, merry, and rich, those girls were like princesses in a fairy tale. They were known throughout Boston, Harvard Yark, and Martha's Vineyard for their cashmere cardigans and grand parties. They were made for legends. Made for princes and Ivy League schools, ivory statues and majestic houses. He is the Sinclair family, and the Sinclair family is money the world over; the Sinclair family is privilege and entitlement and ancient wealth. The Sinclair family is not the American Dream, because they didn't work for what they have, but in America, the Land of the Free, they may pretend to be. The American Dream has been the theme of many “great American novels". The Great Gatsby by F Scott Fitzgerald (1925) is perhaps the most famous and most important of these, but from the twentieth century until now the trope has never died. Of Mice and Men by John Steinbeck (1937) tells the story of two migrant workers who want to settle and buy their own farm, but their Dream is thwarted by prejudice, against the disabled, women, and non-white people. One Flew Over the Cuckoo's Nest by Ken Kesey (1962) pictures the American Dream as a construct imposed by the government to create a regulated society that suppresses individualism, in which the authorities control the masses into believing that they have happiness in their worthless lives. The Road by Cormac McCarthy (2006) shows the end point of the Dream, in a post-apocalyptic America where capitalism has burnt itself out and left the world covered in ash, inhabited by cannibals and refugees in the never-ending purgatory of the road. We Were Liars shows a family living the Dream of wealth, despite their heartbreak, bitterness and the regret of the past. Because what do you do if the Dream does not live up to its promise? You lie. Cady, our narrator, tells us she has had “an accident", but she cannot remember what it is, and the family refuse to talk about it, because to admit it would be to admit themselves less than perfect. “Be normal now," her mother tells her. “Right now. Because you are. Because you can be." This symbolises the American Dream's dirty secret; the fact that it cannot admit its flaws, and must build a facade to pretend that everything is ideal. In The Great Gatsby, this is the Valley of Ashes, where “the ash-grey men swarm up with leaden spades and stir up an impenetrable cloud, which screens their obscure operations from your sight." In contrast to our rich Manhattan MCs, Nick, Gatsby and the Buchanans, the working class toils in the Valley of Ashes, making the capitalist gain of the American Dream possible. They are the underbelly of the Dream; for some to “make it", others must suffer. That is the flaw and the futility of the American Dream; it is exclusive. It claims to accept all; it claims that anyone can reach the top; but in fact only a select group will ever manage. “You only know the me on this island, where everyone's rich except me and the staff. Where everyone's white except me, Ginny and Paulo." “Who are Ginny and Paulo?" Gat hits his fist into his palm. “Ginny is the housekeeper. Paulo is the gardener. You don't know their names and they've worked here summer after summer. That's part of my point." On Beechwood, Gat Patel is the outsider. He is the nephew of one of the Sinclair daughters' Indian-origin partner. Cady, who loves him, wants to think that all their summers can be perfect, but Gat argues that Harris Sinclair will never accept him because of his colour. The American Dream, Gat says, will not let him to the top, because though it claims to accept all, in reality it has a white ideal which he does not meet. I am convinced that Gat is Gatsby's direct heir. In The Great Gatsby, Jay Gatsby works hard and makes millions, hoping to be accepted by Daisy Buchanan, the woman he loves. But she is the old-money all-American princess, like the Sinclairs, who, remember, “are old-money Democrats. Our smiles are wide, our chins square, and our tennis serves aggressive." Gatsby, by contrast, is the son of an immigrant and has come from having no money; his house, whilst extremely lavish, is gaudy in comparison to the Buchanans' Georgian mansion. Unlike their sophisticated taste, Gatsby wears pink suits. However hard he tries, he cannot reach their ideal; the American Dream has promised him everything, but though he makes so much money, he is not truly accepted. Now, look me in the eye and tell me that E Lockhart wasn't thinking of Gatsby when she named her male lead Gat. I will know you are lying. We Were Liars is The Great Gatsby of the twenty-first century, Gat a reincarnation of Gatsby. OK, this is where it gets really exciting. I'm going to put the next bit in white because it contains spoilers for both novels, but if you have read them both (and not if you haven't, because you MUST read them both, and spoilers will be a disaster! ), highlight it and get excited with me. (This is what my English teacher calls “nerd muttering.") If not, skip merrily down and I'll get excited by myself. Both Gat and Gatsby are tragic heroes. A tragic hero is one who has a fatal flaw which leads to his death. Gatsby's fatal flaw is that he cannot see the falsity of the American Dream; he can never stop dreaming, and always thinks he can achieve his impossible hopes. At the end of the book he still believes Daisy will love him -- that's why he waits all night for her outside her house, while she colludes with Tom -- and that's why he doesn't turn her in for Myrtle Wilson's death, which in turn is why George Wilson kills him. If he could accept that Daisy won't choose him, he would not die, but he cannot. Gat, meanwhile, recognises the Dream's falsity, but he lets his love for Cady cloud his judgement. The fire is an attempt on their part to burn the inequalities down, so that they can be together, but of course, the fire is also Gat's downfall. We Were Liars is a beautiful examination of the interplay between privilege and heartbreak, of the lies that we tell ourselves to pretend that everything is fine. I'm not American, so it's hard to say why American Dream narratives resonate so much with me; I think it's because the Dream is, in fact, universal. We all want to hope for something better; we all want to believe that, if we try our hardest, we can reach perfection. We are all disappointed, time and time again. I realise I've not said much about the plot, or the characters (apart from Gat), or really much at all about We Were Liars, but honestly, it's best to go into it knowing very little. I can tell you that it is stunningly written and stunningly plotted, and though it only took me a day to read it has stayed with me and will stay with me for a very long time. I'm already desperate to reread it, and I think it deserves its place among the very best of American fiction. I have seen this one around, sounds intriguing enough. 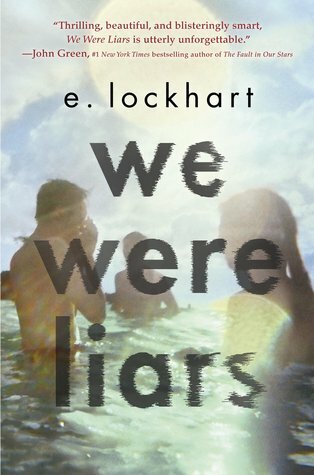 I've heard about We Were Liars, but haven't read it (yet). That's a good point you make, about the dream being universal. Forgive me for being pessimistic, but I must add that the American Dream is also just that- a dream. Granted, something better IS out there, but we look for it in all the wrong places. Definitely pick it up when you get the chance! The Dream is universal, because we're all created to long for something greater, and to desire perfect contentment, but of course there's only one way of getting that and it's not through the accruing of wealth. GAT AND GATSBY! I can't believe I never made the connection! Good call! Wow! What a lovely and in depth review! I've literally seen this book everywhere but never really looked into reading it, as it didn't sound like my cup of tea. But I just might have to pick it up (after reading Great Gatsby. That's, like, the ONE classic I didn't have to read in high school. >.>). I'm also adding The Road to my TBR shelf, too! Thanks for the heads up! I'm soooo glad you liked this! *shrieks happily from the hilltops* THE ENDING KIND OF SMACKED ME IN THE FACE AND I DIDN'T RECOVER FOR ABOUT 9000 YEARS. Except I have never read the Great Gatsby???? So all of those comparisons where lost on me. ;_; I know. I'm a completely uneducated pineapple. IT'S SHAMEFUL. Ahem. I DID! I'm still recovering and really want to reread. But its effect was *slightly* ruined because I'd read a million reviews like ADSLGKJADSG THE ENDING, so I knew it was a big deal, even if I'd never have predicted what actually happened. YOU HAVE TO READ GATSBY THOUGH IT'S LIFE AND AIR. Just sayin'. Ooh, this is such an interesting way to look at We Were Liars (I really loved this book, by the way). You totally make a point about the whole Gat - Gatsby thing; how could I not see that?! I haven't read the Great Gatsby, but I know the story. I'm so glad you liked this book. Thank you for this really interesting post! I love the Gat-Gatsby thing, Lockhart is such a Gatsby fangirl, I'm sure of it! Hm, so I don't think I've ever read any American Dream stories. I've never read any of the ones you listed at least. Kind of strange, since I am an American. I honestly am not sure if the American Dream is the same nowadays as it was when it was first born, or if my view of it's just different? I do believe that a person must work hard if he/she wants to succeed at something, although everyone will have different obstacles to face. For instance, women had to work for the respect that they now have today. Men didn't have to do that, and it wasn't women's fault either. So yes, the "game" is unfair, but it's not a truly a game either. Also, I don't think a person's hard work will necessarily make them rich, or that they will be perfect or "reach the top". They just won't be in a dead end situation. Although even then things don't work out. Life isn't always fair. (Thankfully. If life was fair, Jesus would not have died for us.) To be honest, one of the things that the American Dream has lost is its vision for posterity. I think it's really sad that we don't do things with future generations in mind. Like my previous example, some of the women who fought for equal rights didn't see the results of their labor. Many People in history made history because they were doing it for their children and their children's children. They did it to make a "better world" for the future even if they didn't get to live to see it. We've lost that selflessness. It's very sad. But that's not entirely relevant. To be honest, I didn't actually know what We Were Liars was about except rich people. I don't normally like reading about rich people, because it tends to be cliched. Wealth has many cliches surrounding it and I think one of the reasons is because those cliches often tend to be true. . . which really rubs me wrong. I can't stand cliches and when they turn out to be true I can't stand it even more. BUT you do make me curious about it. I don't know maybe I'll read it. Or maybe I just read The Great Gatsby? You are ALWAYS talking about it. (I'm beginning to think your Gatsby is like my Princess Bride. ;) ) I saw a movie, and. . . I don't know. Maybe I was watching it wrong? Or maybe the movie didn't depict it well. Or I wasn't paying close enough attention because I didn't understand why Gatsby was outsider other than he acted strangely? So maybe I should read the book to get a better understanding of it. Really? Maybe you just don't think of it like that. Gatsby, Of Mice and Men and The Road are all ones I've studied in school, and I guess being in Britain the teachers are more likely to say, “now, class, this is about the American Dream, which is ... ~writes a definition on the board~". So now when I'm reading a Great American Novel I'm more likely to look for Dream themes (ha, I'm a poet). Whereas you maybe just didn't study the same kinds of books in school, or the teachers didn't make such a big deal of it because you are American. But I think the truth is the Dream is universal so I'd say if you look closely, you can find it in most novels. That's interesting what you say about the selflessness thing. Maybe once the Dream was more universal/about commonality, but now it has become more consumerist and more about the individual than about a community. I guess the first settlers in America were all about community, the Pilgrims had a very strong sense of that, I think, which I suppose has been lost since then. I would really recommend Liars (in case you can't tell). Lockhart does explore the cliches surrounding wealth but Cady is a very interesting character with whom I definitely sympathised, so I think she gave her more character than just her cliches. That's probably right. Since I am American that could be why that was never overtly pointed out to me. And I know I've studied the different kinds of books also. Haha! Okay, I'll read it one day. I'm not sure if I could say TPB is my favorite, but one of my favorites? Ya feel? Not the DeCaprio one. It was an older film. What books did you study? Um. Honestly I'm not sure. I know very little about American history. Obviously that war is why you have Fourth of July because it was gaining independence from the British, but I'm not sure what it's called. Probably the same thing, I guess, with “American" slapped in front. That's something I've been thinking about recently in the context of TCATT. I'm a bit worried that Corrie is voluntarily getting involved with the war/putting herself in danger when actually she doesn't have much personal investment, and also she has parents and sisters who beg her to stay at home. And she almost seems a bit overly stubborn. Is it more selfless to be idealistic and fight for a better world, disregarding your own safety, or to follow your parents' wishes and not give them pain? I DON'T KNOW. I might write a post about it. Humph. One of. I do feel. The DiCaprio film is good, but not a patch on the book. Obviously. Very good question actually. Awkward moment here. I was home educated and to be honest my mom never made me "study" any books other than then my textbooks? Although she loves books, she not really into classics, just nonfiction. And she's more of a math person (which was good for me, or else I'd be a failure at numbers). She didn't worry about it because I read a lot anyways. But I had to learn how to think critically about books on my own. When it comes to classics or educational books, I "fangirled" about The Little House on the Prairie books before fangirling was a thing. I read Little Women, does Anne of Green Gables count? I read The Black Arrow. The Island of the Blue Dolphins. I think we read Tom Sawyer out loud. But most of my younger years was filled with any historical fiction based on the Revolutionary War. Or horses books. Or Nancy Drew. So Johnny Tremain was one of my favorites. I loved everything about Johnny Tremain, I nearly wrote a fanfiction with a gender swap. I loved Paul Reverie stories because it had horses AND the Revolutionary War. And then I discovered Sybil Ludington who was basically like a female version of Paul Reverie. There was also Black Beauty (very depressing), My Friend Flicka (my first book with swear words and an MC whom I related to), The Swiss Robinson Family, and Robin Hood (my love! Howard Pyle's version rocks). So I feel like a very uncultured person. *cough* Oh, and I first read Pride and Prejudice at 16? 15? and have read it a zillion times over since. Speaking of Revolutionary War books. They always dealt a lot with what you're talking about. Should we be dutiful little children and keep out of trouble so our parents don't die of a heart attack or do we fight for our ideals and spill our young blood for our passions? (dramatic much?) The RW (it is a chore to spell out) split a lot of families. Some people were still Loyalists and yet sometimes their children or their siblings were Patriots. War always tears family apart therefore it tears apart the foundation of society. It was even worse in the Civil War. Some people didn't even fight on a specific side because they believed in the cause of that side, they just could not stand to fight against the people whom they had grown up with. But by then, the US had expanded and with people constantly moving West, it was not uncommon to have family living all across the country and many families found themselves fighting on opposite sides. But I'm sure you know that. Hasn't the UK (I'm speaking generally) been through a couple civil wars in history? Going to war for something can be selfless, idealistic, or based upon principle, or all of it together. Other times though people get caught up in a war simply because the people surrounding them are fighting and neutral doesn't exist. “Isaac and Edmond and Piper were supposed to be Home Schooled, which as far as I could tell meant reading whatever books you happen to be interested in, and every once in a blue moon having Aunt Penn saying Have you learned any geography? and them saying yes." ANNE OF GREEN GABLES COUNTS FOREVER. Also Prairie and Little Women <33 (Must reread both of those!) The rest of the books you've mentioned I've not read, apart from one Nancy Drew. I have to say I've not even heard of most of them, apart from Swiss Robinson (which I'm pretty certain I never read) Black Beauty and Robin Hood. Never read that one, just had an audio that I listened to death! And only very recently did I hear the music on the radio and shout THAT'S THE ROBIN HOOD MUSIC and my dad was like that's Tchaikovsky and I felt very ashamed. P&P MY LOVE! Rereading needs to happen like now. I think I was 14 when I read it and that was the only time, tragically/remarkably enough. That war paragraph was very perceptive. We had the War of the Roses (Yorks vs Lancasters, I'm not sure of the dates), and the Scottish Wars of Independence in the late 11th/early 12th centuries, in which Scotland gained her independence from England (up until 1601 when the UK was formed). But nothing on the scale of the US Civil War. I guess that no British civil war could ever be on such a scale because, obviously, the US itself is so much bigger. (Did you know England fits into Texas five times?) But I am really interested in exploring the conflict between duty to country and duty to family, between idealism and self-preservation, in TCATT #2. Person: Do you know any good books? Me: Are you ready for this conversation? That quote sounds familiar but the book doesn't. Maybe I've just heard it in passing? More than likely I heard it at a homeschool book fair. XD We did have structure. My mom is all for organization and structure. We had textbooks for all the regular subjects like math, English, History, etc. But not much literature? I had a literature book when I was really young and then I had one for 10th grade (I'm not sure how 10th grade would translate into the UK school system). Outside of that my mom didn't make me read anything except some biographies. Honestly, the way she talks occasionally, I don't think she sees much value in fiction. She'd rather read a real story and she thinks true stories are more important/impacting. Which to an extent is true. But I'll leave off there because I could write for hours on the value in fiction. I like the idea of kids being allowed to read and read too! It makes me think of the Bennets from P&P when Lady Katherine kept pestering Elizabeth about her sisters and their education and did they have a governess? No, they just read. Elizabeth just reads. You've never heard of the The Black Arrow? It's by Robert Steven Louis. He wrote Treasure Island (I've not read TI though). I only remember he wrote it because whenever I envision the cover I can see his long name on it. XD But it's a good book. It's set during a war in England. I think it's the War of the Roses, but it's been a while since I've read it so I could be mistaken. Might need to reread that one too! That is funny about the Robin Hood music! It does sound like a great audio though! I love anything Robin Hood. Howard Pyle's version is beautiful; it made me cry and I'm not much of a book crier. Yes, yes! Reread P&P! It's fantastic. It might be sitting near the top of my TBR even though I reread it earlier this year. :) Although I probably ought to read some of Austen's other works instead. I love Persuasion. But I couldn't finish Mansfield Park for which I eternally apologize to Austen for. I truly wanted to like it, but they never did anything. They just stood around and talked about doing things. I did know that England is significantly smaller. But I did not realize it was that much smaller! That sounds like an excellent topic to discuss though! Especially in a fantasy since war is prevalent in that genre. I actually had more to add on that topic because I was reading a book and it made me think about this conversation. But I think I'll just email instead. Oh, yes! That's a good post! How many grades are there? That must be tough, but I'm sure your commitment to fiction, your degree choice and writerly aspirations, are showing her that fiction IS important, important enough for her daughter to want to devote her life to it. YES! I love that <3 :3 Austen's characters are all such bookworms! Have you read Northanger Abbey?! The heroine, Catherine (I *think* that's her name) loves novels, and her mother has a big thing against female writers, and she generally gets criticised because everyone's like young women of consequence shouldn't read fiction! It's a waste of time! And the book is almost quite meta because Catherine's always like “if I were the heroine of a novel I'd do this and be like this", but of course she never manages. She's always mooning over novels and wishing she had adventures/romances like girls in books. IT'S A GREAT BOOK. Yes yes of course! He wrote Kidnapped and Jekyll & Hyde too. One of my friends is named after one of his heroines, actually. She really likes Kidnapped. I'd like to read it. He was Scottish I think. I'll have to look out for the Howard Pyle one! I wasn't as keen on Persuasion as on the rest of them. Northanger Abbey I love as you can tell. It's less dramatic/serious than the rest, it's shorter and more lighthearted, basically just a celebration of reading and women writers. It's far more a defense of novels than it is about Catherine's love life/whatever. Sense and Sensibility is really really good (it's a bit more dramatic but at its heart it is a SISTER STORY which is my fave) but I think my all time fave (even above P&P?!) is Emma. EMMA IS AMAZING. I could talk for ten years about Emma. MP is the only one I've not read, but I'll be interested to see what I think and whether I share your opinion. There are 12 grades which are preceded by kindergarten. I've not read Northanger Abbey, but I have seen the movie and have always wanted to read it! I think it will probably be my next Austen book when I get the chance to pick one up. I know does discuss novels and such in it, but I didn't realize it was such a huge topic in the book! Now I really want to read it! It sounds fantastic! YES! MY P&P IS LIKE YOUR GATSBY! Haha! I know you love Emma. Movie-wise, that one is my mom's favorite. I bought her the book about two years ago for Mother's day and she recently finished it. I keep wanting to read it as you mention how much you love it from time to time and my mom would keep coming to me when she'd read a part she really likes. But I don't want to be reading it for two years either. . .
Really? That's so interesting, and hilarious. XD I guess it would be bad if someone missed the UK on the map. It is rather important in the grand scheme of things. But hey, if real maps aren't particular accurate than it's okay if my fantasy world maps aren't up to scale and I just sorta think this is the correct proportion. There you go! I am finalising my TCATT map at the moment. I have finally named everything. I have the paper copy by me at the moment, but it's covered in smudges and notes (and a chocolate stain) so I'm going to do a proper one in pen, which I will scan and send to the Beta Baes. Starting Sparks: May // I'm running a giveaway!